The new 2013 Porsche Boxster and Boxster S have only been on sale in the U.S. since June, and have already received five major U.S. awards. 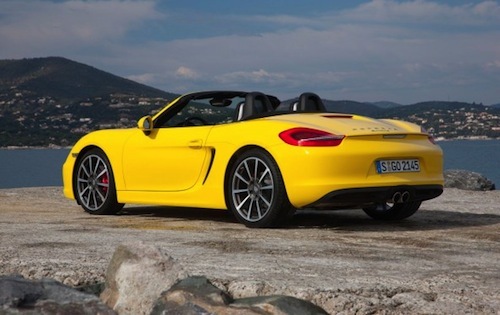 When Porsche unveiled the all-new 2013 Boxster at the Geneva Motor Show in March they knew it would be a winner. When the German automaker launched the all-new 2013 Boxster and Boxster S here in the U.S., they didn’t know it would be getting this much attention. It has now received its fifth major U.S. award since its launch in June 2012. For 2013, the sports car was completely redesigned and is lighter, more powerful and more fuel efficient. It also features a longer wheelbase, larger wheels and a completely redesigned interior. Porsche has just announced that the new 2013 Boxster and Boxster S has just received three new awards. The first of the three awards for the Porsche Boxster is for Car and Driver magazine’s list of the 10Best cars sold in America. This year marks the 12th time in 14 years that either a Boxster or Cayman model has been selected for this honor. The third-generation Boxster is the latest mid-engine offering from Porsche and takes its styling cues from its heritage, the new sports car pays homage to the Porsche 550 Spyder and Carrera GT models from decades past. The Car and Driver 10Best list is compiled each year by the magazine’s editorial staff and focuses on a car’s quality, performance, value and driver satisfaction. To be considered, all cars must fall under the base price cap of $80,000 and be on sale in January 2013. The second award comes from Men’s Health magazine who has named the Porsche Boxster as 2013 Car of the Year, as announced in their December 2012 issue. The all-new Boxster benefits from a longer wheelbase, larger wheels and a completely redesigned interior concept. The Men’s Health editorial team praises the Boxster for its “lust-worthy drop-top” and “affordable indulgence,” citing these reasons for its top spot on the podium. The new Porsche Boxster completed with fifteen contenders for the publication’s list of best cars for 2013. Autoweek’s team of editors choose annually their Best of the Best awards that include car and truck models that are either all-new or substantially new for 2013. The judges chose five cars and five trucks as finalists from the list of three dozen competitors, scoring each vehicle on various criteria including drivetrain, ride quality, handling, exterior, interior design and “fun factor.” The 2013 finalists in the car category were the Porsche Boxster S, Porsche 911, Cadillac ATS, Subaru BRZ and Dodge Dart. The new 2013 Porsche Boxster and Boxter S are selling well and remain a top competitor in the luxury mid-engine segment. This year, Porsche has sold 2,519 Boxster models in the U.S., an increase of 45 percent over last year over the same period when 1,735 cars were sold. Porsche has delivered another winner in their lineup for 2013.